Philadelphia, PA – Today, Governor Tom Wolf was joined by Saint Joseph’s University faculty and students, community leaders, and residents for a non-partisan panel discussion on gerrymandering in the commonwealth. Nearly 200 constituents joined the discussion on how the current Congressional map affects their representation and how they feel redistricting should be approached. This was the second in a series of listening sessions the governor will hold across Pennsylvania in advance of the February 9 deadline for the General Assembly to deliver a redrawn Congressional map. The first session took place yesterday in State College. Along with Governor Wolf, panelists included Joe Powers, Saint Joseph’s University adjunct professor for political science; Micah Sims, Executive Director, Common Cause PA; Jasmine Sessoms, Founder/CEO of She Can Win; Carol Kuniholm, Chair and Co-Founder, Fair Districts PA; and Jonathan Marks, Commissioner, Department of State Bureau of Commissions, Elections, and Legislation. Last week Governor Wolf announced he will enlist a non-partisan mathematician, Moon Duchin, Ph.D., an Associate Professor of Mathematics from Tufts University, to provide him with guidance on evaluating redistricting maps for fairness. 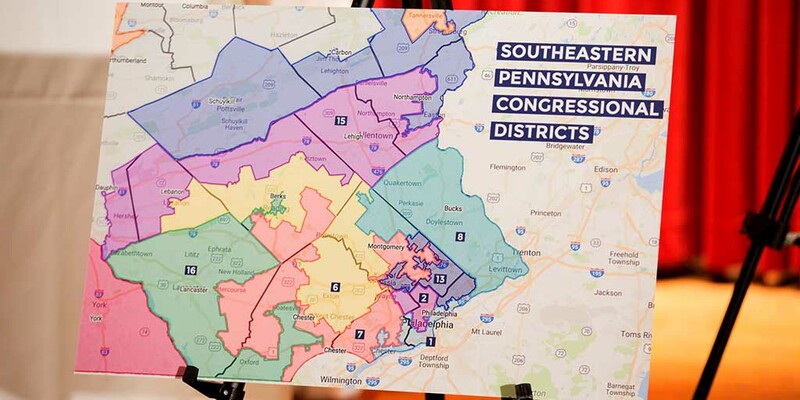 Governor Wolf has made it clear since the Supreme Court ruled the map unconstitutional that he sees this as an opportunity to eliminate partisan gerrymandering and deliver the people of Pennsylvania a fair Congressional map.